Bursting discs vs BPRVs: Which should you choose? To relieve pressure in scenarios where applications are at risk of becoming over-pressurised, the two primary devices used are Buckling Pin Relief Valves (BPRVs) and bursting discs (rupture discs). Information from ASME VIII Division I suggests the two are interchangeable — but which is best suited to your application? Here, rupture disc manufacturer Elfab separates the myth from the facts. Both BPRVs and rupture discs have developed greatly over the past few decades, they offer more benefits than relief valves, due to their full-bore openings when faced with too much pressure. With the costs associated with maintenance and replacements a worrying factor, many people are concerned that BPRVs and rupture discs will deteriorate with time. However, this isn’t the case. Traditional rupture discs that are forward-acting are more susceptible to fatigue over time however, the latest solutions are forward-acting and perform better. This is because newer discs are not subject to process conditions, buckling pins can only buckle at a set point. To test the performance of reverse-acting discs they were monitored over one million life cycles, and it was found they have 3% tolerances. So, even in the harshest conditions, there is little risk of fatigue. Due to such advanced performance characteristics, some rupture discs are now offered with a 3-year warranty compared to the traditional 12 months. Buckling pins are often chosen for tasks that require operations to perform close to a set point. This is largely driven by concerns around manufacturing, operating, temperature and set point tolerances. 95% to 98% of the set point is usually the maximum operating pressure of modern buckling pins. Where original rupture discs didn’t offer such characteristics, reverse-acting discs are available with 3% tolerances and 97% operating ratios. These tighter tolerances mean there is a less dramatic effect on the operation of the rupture disc due to temperature changes. Likewise, in many instances, stock can be rationalised dramatically, reducing purchasing costs. When deciding on relief valves and rupture discs, a key consideration is their tolerance against adverse conditions and their likelihood to corrode. For buckling pin relief valves, the pressure relieving part – the pin – is external to the process conditions, meaning relatively cost-effective materials can be used for this component as it will never be in contact with the process media. This ensures low repurchase costs and confidence that the product should not be affected by this problem. The buckling pin valve is commonly created using materials that do not corrode with contact to the process medium. While sourcing the valve body in corrosive resistant materials may lead to a high initial investment cost, this is a long-term investment as the valve will typically last the length of the project. Although rupture discs are not exposed to the process medium, they can be created with non-corrosive graphite, hastelloy and tantalum. For modern rupture disc designs, in the instance a rupture disc is affected by corrosion, the discs will be fail-safe, meaning customers will be made aware there is a potential problem. In a modern burst detection system, it is easy for users to be notified when a disc fails – this allows for a speedy replacement. In addition, double disc assemblies can be used to allow manufacturing to continue until a suitable maintenance schedule is due to take place. In potentially harmful situations, the equipment must be fully functional and correct installation is essential. With many incidences reported by the HSE being related to human factors, it is imperative that manufacturers offer designs that irradiate this issue. The design of buckling pins means that the installation process of them is simple – it is almost impossible to install them incorrectly. Commonly, customers have thought rupture disc designs could be installed incorrectly, however, modern solutions have eradicated this problem. 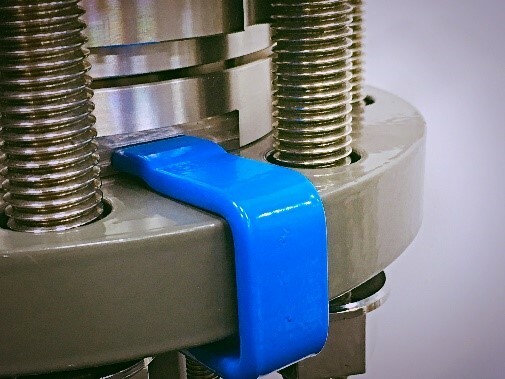 With the introduction of a range of installation tools such as disc alignment tags, flange mounted installation locks (fig. 2) and RFID detection, such occurrences are almost eliminated. The only consistent way to be notified of a product functioning is to incorporate a burst detection system with a pressure relief device. The buckling pin has two conditions, straight and buckled, so it’s clear to see when it has been activated. However, it still relies on an employee noticing this state and doing something about it. For rupture discs however, hearing the disc burst cannot be relied upon – it is encouraged to install a burst detection system. Modern magnetic and reed switch burst detectors are non-invasive to the process and therefore not subject to spurious alarms, back pressures or damage during installation, unlike original designs. Such detectors give an instantaneous notification of a burst, and can even be wired to a control room to shut down a process as a further safety measure. By installing this system, it decreases lost production time and capabilities. Secondly, by stopping the process it ensures that no dangerous gases are leaking into the environment. Thirdly, it enhances overall safety. To improve site efficiencies, reducing and improving maintenance schedules is key. A company’s quality manual will usually outline the required regular and routine maintenance required for their device. A benefit of buckling pins for manufacturers is that they are mainly maintenance free and can be inspected without breaking the line. Replacement pins can also be installed in a matter of minutes without disrupting the line. Opposing this is the breaking disc which must be removed from its holder to be examined. However, installation tools’ quick and simple checks of the rupture disc state mean this can be done without stopping the line, making the maintenance of both solutions equally as rapid and as environmentally friendly. Some rupture discs now come with a standard 3-year warranty, increasing maintenance intervals accordingly. When choosing a device for an application, manufacturers still face the issue of which to choose. Line size, initial investment and long-term investment should all be considered before deciding. As modern-day designs offer comparable performance characteristics, considerations based on an application would make for a better decision-making process, rather than worrying about these common misconceptions that on the whole have been eradicated through continued advancements.